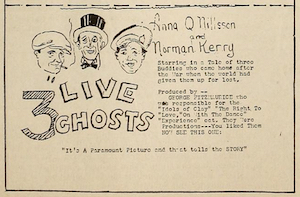 Henry K. Miller in the BFI's Sight & Sound magazine discusses recently discovered Hitchcock silent film work—The Man from Home (1922) and Three Live Ghosts (1922)—but the versions found bear evidence of hands other than Hitchcock's. Results from Sept 10 Bloomsbury auction. Clues 33.2: Patricia Highsmith, Per Wahlöö. Foxwell on Femmes Fatales blog. The Evil Mind (aka The Clairvoyant, 1934). An early ghostly turn by Agatha Christie. The Suspect (dir. Robert Siodmak, 1944). A Slight Case of Murder (1938).